Let the blue sky in the window and the smell of roses gently wake you from your comfortable West Wing bed. A lush garden and cool swimming pool are waiting for you. Plan the day while enjoying breakfast on your private terrace in the shade of the surrounding trees. 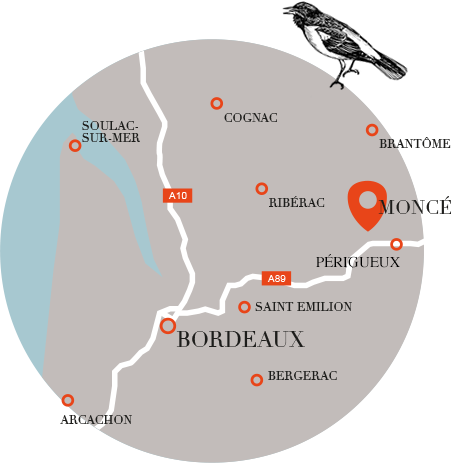 Will you go for a walk in the nearby fields, visit the market in Saint Astier, or start reading a new novel by the pool? 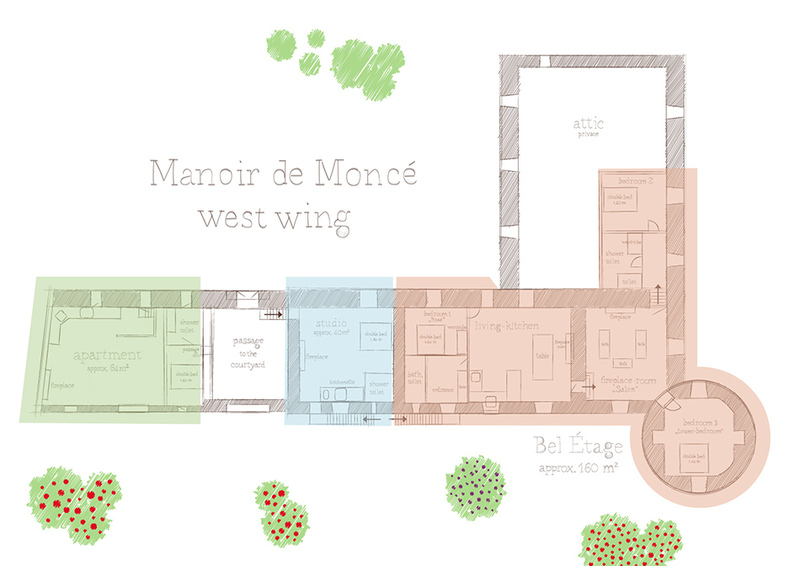 However you plan to spend your days at Manoir de Moncé, we are looking forward to welcoming our first West Wing guests as of May 2016. We have spent 1,5 years full of enthusiasm, attention to detail, as well as considerable physical and financial effort, to rejuvenate these old walls and return them to their former glory. In order for this holiday estate to rise and shine again, we dried out walls, repaved the court yard, painted 75 windows, wooden blinds and doors, tamed the wildly growing garden, trimmed fruit trees and finally topped it off with the construction of a 14x6m swimming pool. The interiors of the individual apartments have been designed with great care and focus on quality. Ranging from furniture, wall finishes and fabrics, every little detail has been chosen and combined with great love and care. Supporting companies included Bungalow, Les Toiles du Soleil, Jan Kurtz, Bemz, Farbenfreunde, Bitossi and Overbeck and Friends, who all helped to turn our creative vision into reality. The West Wing of Manoir de Moncé offers room for up to 10 people, and is well suited for a large family or group. For your convenience you will be presented with five bedrooms with either a Queen or King size bed. There is also the option of renting individual lodgings.